Bold and modern, this gracefully sculpted stool is striking and versatile. We love this as a small seat, footstool or even stand-alone artwork. This eclectic piece is artisan-crafted in Portugal of reinforced ceramic and fired in a matte white finish. 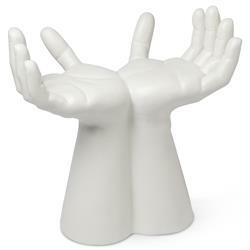 The hand sculpture adds an opulent, organic touch to your home or office.